This entry was posted on Thursday, March 13th, 2014 at 3:59 am	and is filed under Flies. You can follow any comments to this entry through the RSS 2.0 feed. You can leave a comment, or trackback from your own site. Whatever you don’t end up using, send my way…ok? You look well armed…8 pound bones beware. You’re well prepared for Bonefish Fly Poker for sure. We need a sign; “Hey bonefish! We have thousands of flies right here for the taking, in every size and color you can imagine! Get yours today! (Additional stock on hand). Amigo – we are peas in a pod. I leave on Monday for a 2-week honeymoon in Placencia Belize. My lovely wife Sara has consented to a couple guided days after permit, as well as some early morning strolls (as long as I don’t wake her up) for fishing. 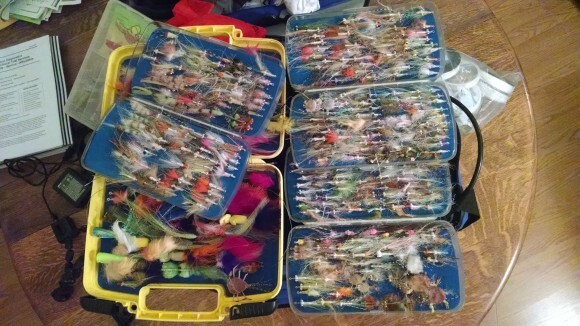 I’ve packed two 8-weights, a 9-weight, and 3 Plano model 3601 boxes loaded with crabby pattys, avalons, bauer fur crabs, puffs, clousers, baby tarpon bunnies and other assorted goodies (couldn’t figure out how to attach the photo), which I’ll download into pocket-sized fly boxes as needed. And I still have a couple days to tie…I also have a spinning rod stashed away with a half dozen tube lures for cuda. In short, your mental state is in perfect (dis)order! Good luck on Long Island – had I not had Belize planned, I’d have attempted to weasel my way into sloshing around Long with your crew. Keep an eye on that Jeffries dude, he’s a pretty good tier (and caster), but I wouldn’t put him above getting a couple fingers in one of your fly boxes – especially if he’s been nipping at the Azul…. Belize for a honeymoon… that sounds familiar! Have a great time down there! Long… looking forward to it and I’ll keep and eye on that Jefferies character!